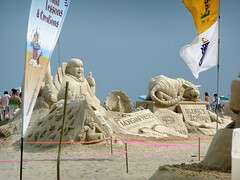 This past weekend, at the 2010 Master Sand Sculpting Competition at New Hampshire’s Hampton Beach, I came face-to-face with my new American idol: the Coca-Cola Buddha, the patron deity of appetite and abundance. 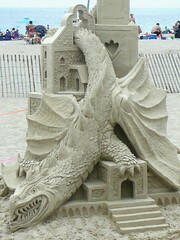 This wasn’t the first sand-sculpting competition I’d been to; last July, J and I checked out the crumbling masterpieces that remained weeks after the New England Sand Sculpting Festival at Revere Beach in East Boston. But among the various sculptures at that event, there was nothing even remotely Buddhist, so I wasn’t expecting to come face-to-face with divinity on the New Hampshire seacoast this weekend. Like any genuine spiritual experience, my Coca-Cola enlightenment came as a complete surprise. In the interest of iconographic accuracy, I should note that the Coca-Cola Buddha isn’t technically the Buddha; he’s Hotei, a fat-bellied monk who carries a cloth bag filled with treats. If you’ve ever rubbed a Buddha-belly for good luck, you’ve had a close encounter with Hotei, the Buddhist equivalent of Santa Claus: a fat, jolly man who brings happiness wherever he goes. Whereas the historical Buddha is an emblem of regal detachment, Hotei is a reminder of life’s sweet abundance. Buddhist monks live on alms, so a fat monk is one that is particularly well-loved. Because Hotei is such a happy, jolly fellow, his begging-bowl is always full, and he is happy to share that abundance with others. Ultimately, it doesn’t really matter whether the Coca-Cola Buddha is the Buddha, as Hotei carries a bag full of lessons all his own. 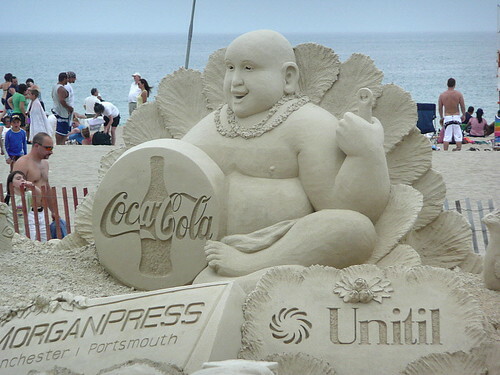 In his guise as the Coca-Cola Buddha, Hotei reminds us to fully enjoy life’s simple pleasures. Whereas the historical Buddha was a pampered prince who renounced his wealth and then experimented with various ascetic practices, you get the feeling that the Coca-Cola Buddha hasn’t said “no” a day of his life. The historical Buddha eventually abandoned asceticism, deciding that the Middle Way of moderation was the proper spiritual path…and both Hotei and the Coca-Cola Buddha take the Middle Way one step further, suggesting it’s better to occasionally over-indulge and enjoy a soft-in-the-middle belly-laugh (and share that glee with others) than be a Seriously Religious sour-puss concerned only with philosophical intangibles. The Coca-Cola Buddha believes, in other words, that life is short, so have dessert first! The Coca-Cola Buddha also reminds us to, in the words of a famous soft-drink slogan, obey your thirst. In a time when obesity has become an epidemic, it’s easy to view food and appetite through the lens of fear. As Michael Pollan argues convincingly in The Omnivore’s Dilemma, Americans suffer from a national eating disorder whereby we obsess more and more over the healthfulness of our food while simultaneously growing fatter and fatter; in the words of Raj Patel, we live in a world that is simultaneously stuffed and starved. Given conflicting medical reports about which foods are and aren’t good for us, it’s no wonder our mealtimes are often fraught with worry. The Coca-Cola Buddha offers diet plan far more simple than even the most popular fad or fast: when you’re hungry, eat; when you’re thirsty, drink. This is the wisdom of intuitive eating, a philosophy embraced by Zen masters, psychologists, and self-help gurus alike. Too often we allow our head or our heart to make our culinary decisions, eating (or abstaining) from a particular food because we think we “should” or smothering our emotions with aptly named comfort food. If you listen to your gut, however, your body will tell you loud and clear when you’re hungry and when you’re full. The Coca-Cola Buddha knows that our bellies are usually far smarter than our brains. While our brains send us to the kitchen in search of Chubby Hubby to distract us when we’re sad, anxious, or bored, the wisdom of our gut is eager to tell us how much food we really need. Once you’ve learned to listen to the wisdom of enough, then you can share that abundance with others. Lastly, the Coca-Cola Buddha knows that appetite can be sated only in the moment, and only for oneself. I can dream, imagine, and anticipate the soothing refreshment of a cool drink, but that imagined idea won’t quench my thirst. Several weekends ago, I gave consulting interviews at the Cambridge Zen Center, and in lieu of hot tea, the Head Dharma Teacher left a small pot of ice water in the interview room for me to drink. The day was steamy, so I was sweating beneath my heavy Dharma Teacher robes…and when I raised a cup of cool water to my lips, I was delighted to smell the tang of a lemon slice floating among ice cubes. Just like that, a cup of cold lemon-water was more refreshing than Nirvana, a full serving of Ahhhhhhh soothing my summer-shriveled cells. But as much as I try to describe the deep-seated satisfaction of enjoying a cool drink on a hot day, the only way you can “get” this experience is to go to your own kitchen and pour your own glass: drink up! A long time ago in New York, a student questioned Zen Master Seung Sahn about the efficacy of mantra meditation: do I have to understand the words of a chant or mantra in order to benefit from repeating it? Seung Sahn insisted that only three things are important when you meditate upon a mantra: first, your reason for doing it; second, your faith that it will work; and third, your tireless effort to keep that mantra. This is the timeless wisdom of Zen Master Seung Sahn, big-bellied Hotei, and the all-American Coca-Cola Buddha. This Present Moment is a brimming glass filled with both sweetness and sorrow, and only you can belly up to the bar called Life to savor it, moment to moment, good to the last drop. 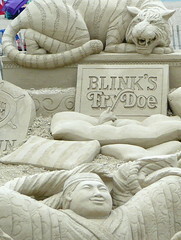 Click here to more photos from the 2010 Master Sand Sculpting Competition at Hampton Beach. If you want to visit the Coca-Cola Buddha and his sandy friends in person, the sculptures will be on display through June 30th. Enjoy! Well, either that or one more sad example of Capitalism trying to co-opt everything to its own purposes. Or, another example of Art co-opting Capitalism for its purposes. Coca-Cola was one of the sponsors who contributed to the cash prize the sculptors were competing for, so without Capitalism, there would have been no prize or contest. If there’s any co-opting to be done, I’d vote for artists co-opting Capitalism. I guess. I notice, though, that your site, like mine, doesn’t have any ads, Google or otherwise. I don’t choose to put any ads on my blog…but WordPress does sometimes display ads on sites like mine, to generate revenue to pay for their free features. If you have a WordPress account and are logged in, you won’t see the ads…but otherwise, you will occasionally see them. Moral of the story: there’s no free lunch, anywhere or any time. Actually, I think they don’t even serve ads to people with WordPress.com cookies on their computers, so if you regularly visit blogs here, you’ll never see them. A bunch of us had to raise a stink in the forums for a couple of years to get them to introduce the ad-free upgrade, which ended up being considerably cheaper than the more paranoid, anti-Automattic types had assumed. Like you, I have no problem with paying to get the generally great service WrodPress.com provides. 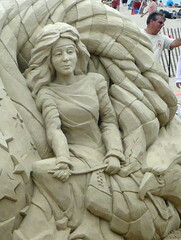 I love seeing sand sculptures, especially the large and detailed ones! I actually saw an ad on my blog once, when I was logged out & had cleared my browser cookies for some reason or another. It was actually quite funny to see an AD where I wasn’t expecting one! But yes, $29.97/year is reasonable considering how much I “use” my blog in a typical year, which is exactly how I feel about Flickr’s $25/year Pro upgrade: worth every penny. 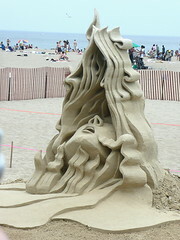 Kenju, I’m like a little kid whenever I see sand sculptures like these. 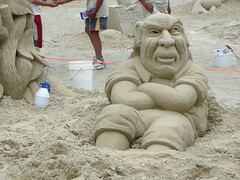 I simply can’t believe someone can make all this out of SAND! The sculptures are awesome and impressive and I understand your case about cooptation, but to me it’s shocking to see a buddha with a coca cola logo. It seems disrespectful. There wouldn’t be a Christ with a logo – although I understand that milefo (that’s how hotai is known to me) has a joyful message. I’ve seen many buddha in Asia with food offerings and soft drinks but not in this way. Businesses here in the States wouldn’t present Christ with a logo because Christians would make a huge uproar. Buddhists, however, aren’t as protective of their iconography, so it’s VERY common to see Buddhist words & symbols to sell everything from beer to household cleaners. It might be disrespectful, but it’s so widespread, seeing Hotei holding a Coke is like seeing Santa holding a Coke. The Buddha and Buddhism have already been co-opted for marketing purposes; this example is merely one of many. Lorianne, I loved this post! My initial reaction was like Loren’s, but I love the way you’ve taken what many of us would see as cynical, exploitative marketing and turned it into a DHARMA LESSON! Bravo! It makes me see how quickly I leap to judgment and turn to an us-them mindset that is immoderate and false. Your positive embrace of the Coca-Cola Buddha is refreshing! Steve, I guess I see the commercial co-opting of Buddhist words and imagery — the so-called “Zen” of everything from spa resorts to high-end furniture — to be so pervasive, I’ve taken the philosophy of “if you can’t beat ’em, join ’em.” So maybe my resignation in the fact of widespread commercialism is even more cynical than your initial response! Instead of fighting the corporate machine, I believe that machine is inescapable. If resistance is futile, why not try to find the wisdom within the inanity?